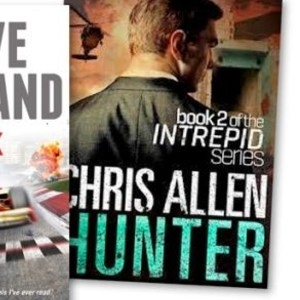 Check out a selection of past and current media and blog coverage of Chris Allen, author of the Alex Morgan and Intrepid action adventure series. Also author of a new children's series called Agent 686 and a fresh thriller featuring his newest protagonist, Benjamin Rhett. Gerringong Author Chris Allen joined the Australian Military straight out of school to gain the experience he thought he needed to become a writer of action novels. He got more than he bargained for when he rose to the rank of Major in the elite 3RAR Paratroop Battalion and saw action in Africa, South East Asia, Central America and East Timor. Thriller Writer Chris Allen left an action-packed career in the Australian Military - he was a paratrooper - to tackle a life-long dream to write action-packed fiction for a living. With five top selling books published and another on the way, he's carving a spy niche all of his own in the global market. "Recently my wife and I made the decision to relocate our lives down here on the South Coast and we feel so lucky that we pinch ourselves every day for having made the move." "Chris Allen has been there, done that himself, a former elite paratrooper for 20 years, who moved into law enforcement and humanitarian aid work. His background makes you wonder how much of his books are based in fact, and that's the scary bit. We've only recently discovered Allen and his protagonist Alex Morgan, Hunter is the second book in the Intrepid series, but he's on the reading list now. Intrepid is the black ops division of Interpol, and here Morgan is on the hunt for Serbian war criminals. In a way it was nice to get away from the War on Terror, different bad guys made this a more interesting read, without meaning to offend anyone. More Ludlum than Reilly; if you like action you have to think about, try Allen. Former soldier Chris Allen is the author of three action thriller novels, Defender, Hunter and Avenger, all published through Momentum Books, the digital only imprint of Pan Macmillan Australia. His books are described as "escapist action thrillers for realists" and he brings his 20 years experience serving in conflict zones around the world to his writing. NOT many best-selling authors have truly lived the part, but this Australian has — from ex-soldier to aid worker and even counter-terrorism expert. IT’S Perth, WA, in the early 70s. All you think about is playing the drums, maybe being a writer of some sort, and essentially being a bit of a larrikin. Little do you realise one day you will be staring down the barrel of four best-selling novels, a potential international movie deal, and yes, the barrel of a rifle. Then you come across a man — or rather, two men — who essentially change the course of your life.